Pumping and storing your breast milk can be a great way to provide your child with your milk when you have to spend time apart. Plus, since you can store breast milk for up to a year depending on your freezer, you can create a nice stockpile of milk to continue to give to your child long after you stop breastfeeding. But, whether you're saving it for a few hours or a few months, the key is to store it safely. Here are the guidelines and recommendations for the safe storage of breast milk. You can store your freshly hand expressed or pumped breast milk at temperature, in an insulated cooler, or in the refrigerator. After pumping, place a lid securely on the collection bottle or seal the storage bag, and keep the container away from heat and out of the sun. At temperatures higher than 77 degrees F (25 degrees C), it may not be safe to store your milk at room temperature. You should place it immediately in the refrigerator instead. To keep your breast milk cold inside of the cooler, you can use frozen gel ice packs or bags of ice. The air in the back of the refrigerator is colder than the air up front, so put your breast milk toward the back. You can store frozen breast milk in an insulated cooler for a short time to transport it. Depending on the type of freezer you have, you may be able to store frozen milk for up to a year. You shouldn't leave frozen breast milk out at room temperature, not even to defrost. To safely defrost frozen milk you can put it in the refrigerator, in a bowl of warm water, or run it under warm tap water. You can use an insulated cooler with frozen gel ice packs to transport frozen breast milk from one place to another. The amount of time that your milk can remain frozen in the cooler with ice packs depends on the temperature and the length of the trip. If your breast milk begins to defrost, you should use it immediately or store it in the refrigerator. You can defrost frozen breast milk in the refrigerator, or store it there after you thaw it out. Once it thaws, you should not refreeze it. It should be used within the next 24 hours or thrown away. Place your milk in the back of the freezer compartment where it is colder. You can keep your frozen breast milk in a standard top and bottom or side by side refrigerator/freezer unit for three to six months. Just don't store it on the freezer door since the temperature is not as consistent on the door as it is in the back of the unit. When not opened regularly, a deep stand-alone freezer can keep your breast milk safely frozen for six to twelve months. If you defrost your breast milk in the refrigerator but do not warm it up, it can stay out at room temperature for up to four hours. Milk that has been defrosted in the refrigerator and not yet warmed up can be placed in an insulated cooler with ice packs for up to 24 hours, as long as it remains chilled. You can store thawed, but not yet warmed, breast milk in the refrigerator for up to 24 hours. You should not refreeze breast milk that has been defrosted or thawed. If you have thawed your breast milk in warm water, do not leave it out at room temperature. You should use it right away or place it in the refrigerator. Once your breast milk has been warmed, you should not put it into a cooler to store or transport. You should use it immediately or place it into the refrigerator. You can store warm, previously frozen breast milk in the refrigerator for up to four hours. You should not refreeze breast milk once it has been defrosted. 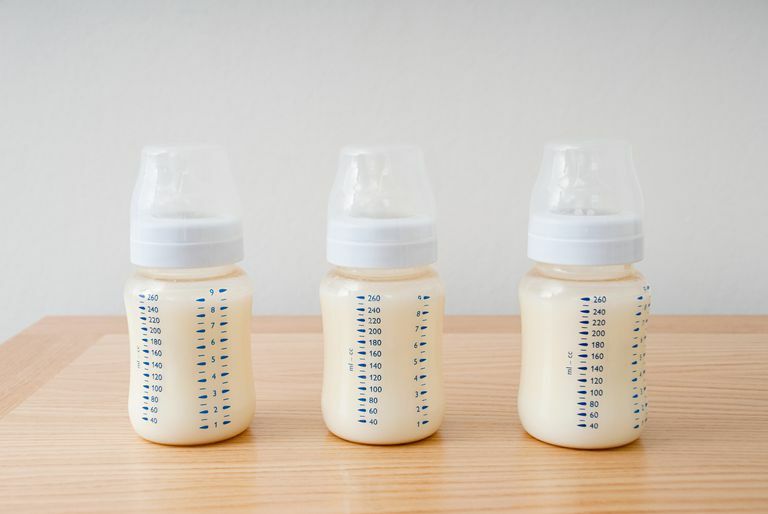 You should not store breast milk that is left over after a feeding. If there is any breast milk remaining in the bottle once your baby has finished his feeding, you should throw it away. This guide provides information for storing breast milk you collect at home for a healthy, full-term infant. If your child is premature or hospitalized for an illness, these guidelines may not apply to your situation. Talk to your doctor or the hospital staff for more information. Academy of Breastfeeding Medicine Protocol Committee. ABM clinical protocol# 8: Human milk storage information for home use for full-term infants. Original protocol March 2004; revision# 1 March 2010. Breastfeeding Medicine. 2010;5(3). How Long Can Breast Milk Sit Out at Room Temperature? Can You Add More Breast Milk to a Frozen Bottle? Can You Add Fresh Breast Milk to Breast Milk You Already Collected?